Google’s Play Store is filled with various lock screen apps for Android. PIN Genie Locker is one of them. With over a million downloads and a high rating of approximately 4.6 stars, it is no wonder it gets a decent amount of attention. PIN Genie Locker is such a simple and conventional, yet such different lock screen application. The first noticeable thing both on the Play Store and after installation are numeruous permissions you need to give to the application itself just so it could funtcion properly. After a relatively short process of giving some already mentioned needed permissions (notification access etc.) you are expected to select a type of lock screen. This is where PIN Genie, in a way, differentiates itself from other apps of this type. It gives you the standard default iPhone-like swipe screen, PIN and pattern we are all used to using, but it also gives you the option to set a somewhat amusing and by all means more secure type of a 4-digit lock screen. App creators, alongside with lots of users, define this feature as ‘revolutionary’. In a way it is. The mentioned system consists of 4 circles containing 3 numbers. For each number in your PIN, it is only necessary to click on a circled batch with your number in it. 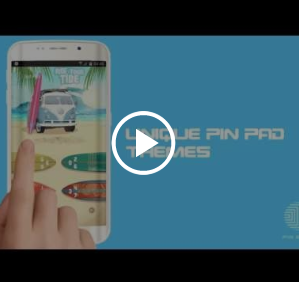 This system is praised by most because it allows you to unlock your phone with ease, but those around you will never be able to figure out what your security code is, as it is the case with the conventional PIN lock screen. With that being said, PIN Genie Locker’s focus is certainly on security. In this aspect, the app does pretty well. The only downside of it is that it requires you to constantly confirm your authenticity and it’s even mandatory to enter your email address. Even though the proccess is pretty simple and it doesn’t require much time, for some users who like more simple things it can be exhausting. However, since the app cares so much about security, it provides you with great protection. Not only that it protects your phone with its innovative system, but it captures selfies of those who try to break into your mobile device, which is undoubtedly a great feature. 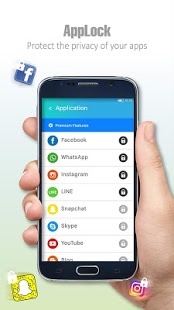 In addition to that, PIN Genie gives you the ability to lock individual apps on your phone. Also, it is virtually impossible to lose access to your phone, since you have the backing of both security questions and connection with your email address which make sure you never get locked out of your own information. Regarding PIN Genie’s design, it is pleasant on the eye. It only contains a few themes which are pretty similar and their only difference is the clock, but each theme looks great. You can use any wallpaper from your phone, but stock wallpapers that come with the app look exceptionally good. It is visible that designers put lots of effort in making the weather info and forecast page, which is available on just one swipe, since it looks more than decent. The only true flaw of the design are annoying ads that are more often than not present on the starting screen. Lookswise, it is probably not one of the best, but it outshines most lock screen apps on the market. On top of all that, PIN Genie runs smoothly, even on lower tier phones. Compared to most other apps of this type, PIN Genie Locker’s performance is excellent. However, it lacks a smooth transition upon unlocking, which would give this app a great final touch. 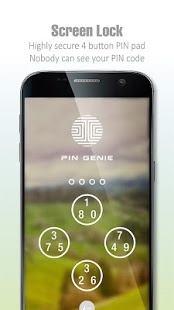 All in all, PIN Genie Locker is a solid Android lock screen app, which is confirmed by all the ratings users have given it on Android’s app store. It has its advantages and flaws, but its strong points outshine its imperfections. This is an app which protects your phone well and looks good. It is perfect for users who are into security and want to add a little inventiveness to their mobile device.